The ESPN Friday night showcase game is a very important one this week. Boise State is currently ranked No. 4 in the BCS Standings, and they know they must win every game impressively to even have a chance to play for a title this year. With just four games remaining, their chance to wow the voters is slowly running out. Boise State and Idaho are intense intrastate rivals. You can expect both teams to put forth plenty of effort on Friday night in the Kibbie Dome. The Boise State Broncos have one of the best offenses in the nation. 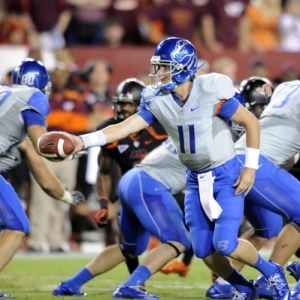 Kellen Moore is legitimate Heisman Trophy contender once again this year. Moore is completing 71 percent of his passes, and he has already thrown for 2,372 yards this season. The statistic that impresses me the most is his ability to take care of the football. Between all of last year and the 2010 season so far, Moore has thrown 60 touchdowns and just seven interceptions. You won’t find a better ratio than that one! Doug Martin and Jeremy Avery form a great tailback tandem for the Broncos. Titus Young and Austin Pettis are two of the best receivers in the nation. It’s very tough to find a weakness on this offense. The Idaho Vandals have a solid offensive unit. Nathan Enderle is a pro prospect at the quarterback position. Enderle has thrown for 2,484 yards this year. The problem for Idaho is that they are far too dependent on their passing game. The Vandals rushing attack averages only 86 yards per game. Defenses can be ready for the pass almost every play, because Idaho rarely has any success on the ground. Justin Veltung is a playmaker at the wide receiver spot for Idaho. Veltung averages 23.6 yards per reception, and he already has eight touchdown catches this year. The Boise State defense is ranked second nationally in total yards given up per game. They allow only 12.6 points per game, which is also second best in the country. While the offense tends to get all the credit, the defense is a very high-quality unit as well. It all starts with a strong defensive line for Boise State. The Broncos have 31 sacks already this year, and they often do that without bringing their linebackers or the secondary. Additionally, this defense is allowing opponents to convert on only 28.6 percent of their third down conversion attempts. The Idaho Vandals defense is about as bad as you will find. This is a unit that allowed a stunning 844 yards to Nevada last week. To put that number in perspective, Boise State allows 844 yards over the span of almost four games, on average. Idaho is bad against the run and the pass. The one thing that has saved them in several games this year has been their ability to force turnovers. They will definitely need to make Boise State turn it over in this one, or it will be a very long game for the Vandals defense. The Broncos opened as 33-point road favorites, according to the college football odds, but that number has since risen to 34.5 at most books. Boise State is clearly taking the majority of the public money in this matchup. The total opened at 61 points, but the number has quickly moved up to 63. Boise State has dominated this matchup over the course of the last few years. The Broncos are 9-4 ATS in the last 13 meetings. More recently, the home team has cashed in every time. The home team is 7-0 ATS in the last seven matchups between these two. The ‘over’ is 4-1 in the last five meetings as well. The Boise State Broncos will be out for blood in this one, because they know they need to win in impressive fashion. I see no reason to believe that Idaho’s defense will be able to slow them down. Idaho should put up a couple touchdowns as well in this one. I think the ‘over’ is the way to go in this game.